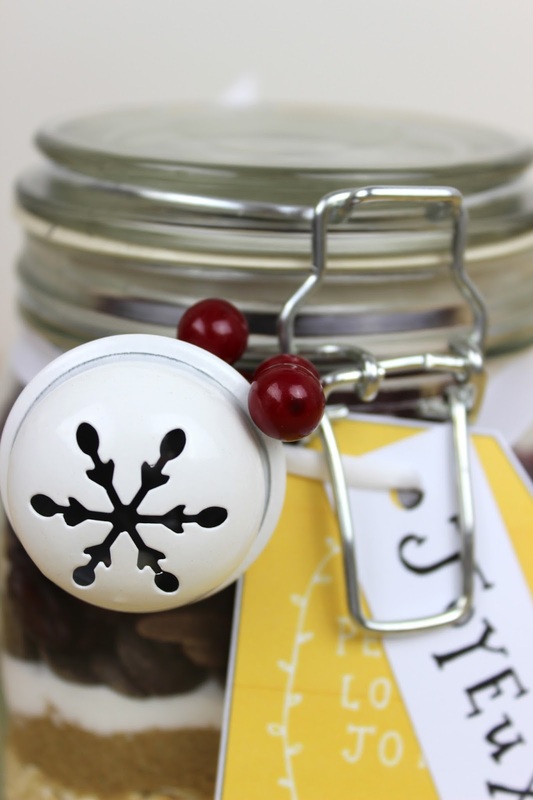 The Little Whisk & Co: DIY Christmas Baking Jar. Happy Monday everyone and welcome to the first post of Blogmas. Whilst it has been a crazy last couple of weeks, I am starting to piece together a range of posts to share with you up until Christmas Day! To start the ball rolling, today I am going to share with you are super simple holiday gift that is unique and screams out thoughtful as it is handmade, which means that you can tailor it accordingly. The first recipe is a classic Triple Chocolate Brownie Mix. Who doesn't love brownie, which is why is the perfect gift to make. To gift: layer 3/4 cup (130g) brown sugar, 1/2 cup (110g) cater sugar, 3/4 cup (75g) cocoa powder, 1/2 cup (75g) plain flour, 1/4 teaspoon baking powder, 100g dark chocolate melts and 100g white chocolate melts in a 1L - 1.25L glass jar. To Make: preheat oven to 160-degrees (325F). Place all of the dry ingredients in a large bowl. Add 150g melted unsalted butter, 1 teaspoon vanilla extract and 3 lightly beaten eggs and mix well to combine. Pour the mixture into a lightly greased 20cm square baking tin lined with baking paper. bake for 30-35 minutes or until just set. Allow to cool completely in the in. Cut into squares to serve. Makes 16. To add a little twist to the classic brownie recipe above, substitute the chocolate melts for 100g macadamia nuts (can be finely chopped, but not necessary) and 50g dried cranberries. Use the exact recipe as written above and mix up the flavoursome ingredients. 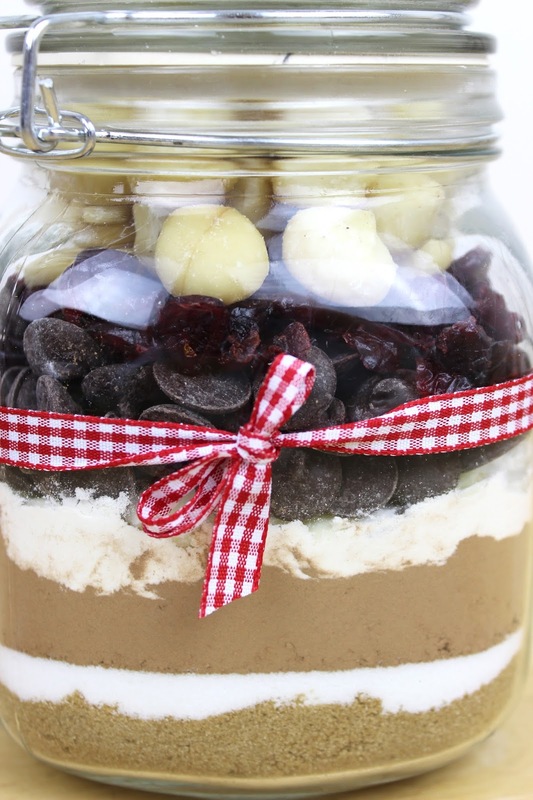 Now for a scrumptious Cranberry choc-chip cookie mix. This recipe is something a little different, however is still delightful and sweet with the bursts of chocolate and cranberries. 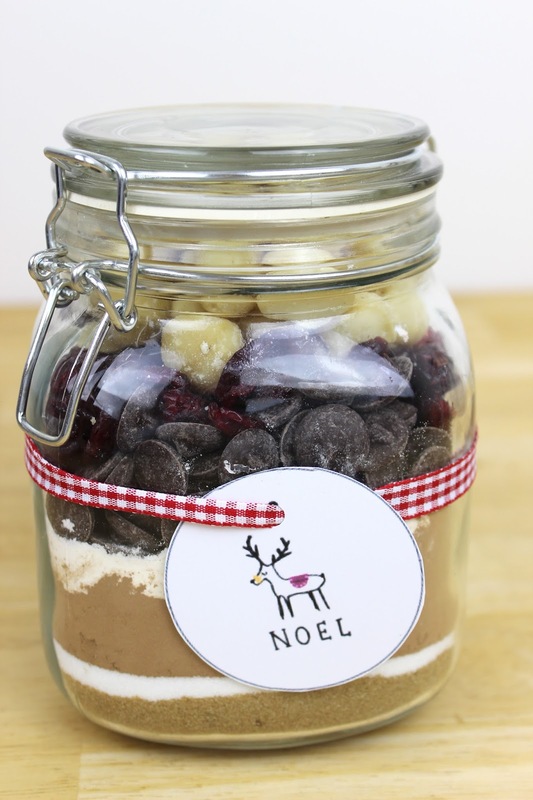 To Make: layer 1 cup (150g) plain flour, 1/2 teaspoon baking powder, 1 cup (90g) rolled oats (can be blitzed to a fine crumb if necessary), 1.2 cup (90g) brown sugar, 1/3 cup (75g) caster sugar, 2 teaspoons mixed spice, 1/2 cup (95g) dark chocolate chips and 3/4 cup (105g) dried cranberries in a 1L- 1.25L glass jar. To Make: Place the dry ingredients in a large bowl and add 115g melted unsalted butter, 1 lightly beaten egg, 1 teaspoon vanilla extract and mix to combine. Roll tablespoons of the mixture into balls and place on large lightly greased baking trays lined with baking paper. Flatten slightly and bake for 8-10 minutes or until golden, but stills lightly soft in the centre. Transfer to a wire rack to cool completely. Makes approximately 20. I choose to add decorative labels which I found from here and here, as well as christmas accessories. 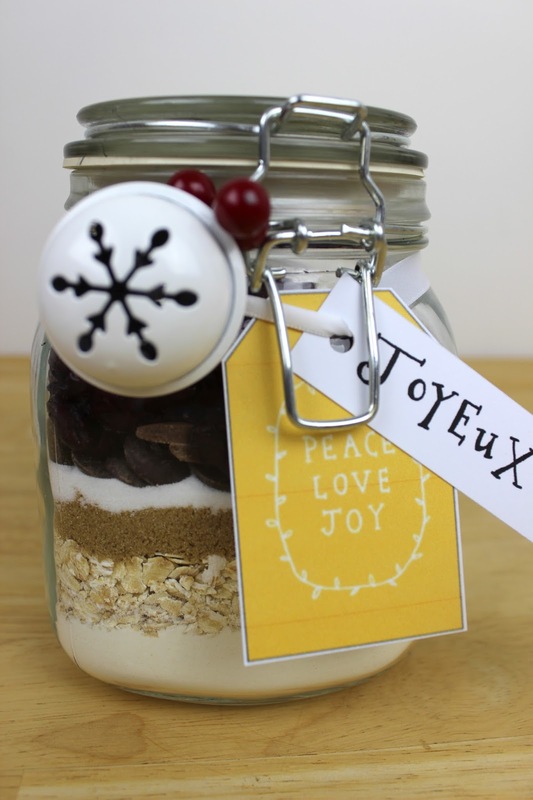 Once the baking mix is placed in the jar, feel free to go crazy with the decorations, as this will make it more personal. You could add the instructions to the gift on the back of the label of create a new mini card that has all the written steps to follow - once again it is entirely up to you! I hope that you enjoyed the first Blogmas post and remember to come back everyday for a new DIY or recipe. I love making, giving and receiving these! Perfect for last minute holiday gift giving.